A SOPHISTICATED antiqued wooden wine holder, enhanced with a grapevine pattern, makes an impressive and unique gift for clients, friends, and family. Complimented with a superb collection of Special Blended Teas, Saskatoon Berry Chocolates, and a Refreshing bottle of Saskatoon Berry & Apple Sparkling Cider (non-alcoholic), $42. This design is also available in a Gourmet layout without the cider, includes gourmet cookies, chocolates, nuts, coffee, teas. $55. 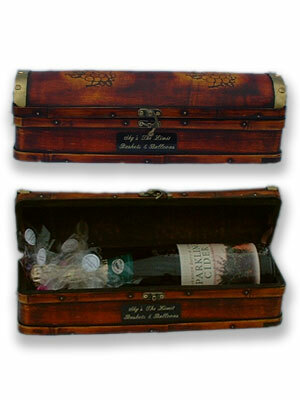 Engraving Note to Corporate Clients: Your Company Name can be engraved on the wine box. Three to Five days notice is required for engraving. (Minimum order of six). Additional charge for engraving of Company Name or Logo.